Well whichever one @pakashra goes with will count, however it was @saveria201 that made the legendary, but he (or she, I’m not sure) already reposted one. @baryonyx69 you can choose whomever you like to join, I don't mind if you choose @pakashra's entry over mine. But I'd love to be involved it seems like a fun contest! Here lol. Hope it counts. I decided on a new one. 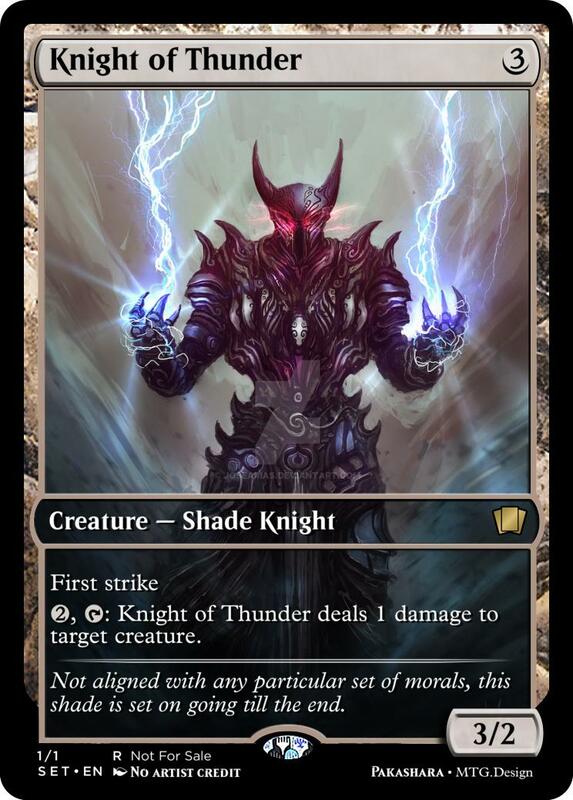 Please welcome the Knight of Thunder! Am I too late to this challenge as well? 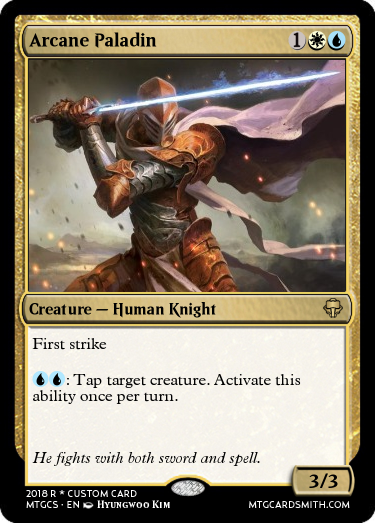 The Arcane Paladin, using magic and an enchanted sword! Ok, I will accept the entry @AxNoodle. I have been a little behind on this, sorry for all who entered, but I promise I will start this tomorrow. Thanks for your patience. @AxNoodle That's the picture of Fiendslayer Paladin. @baryonyx69 Is the art allowed seeing as it is mtg art? It is your call! It's late at night so my brain isn't working, so could you help me out? Is this a cool idea? 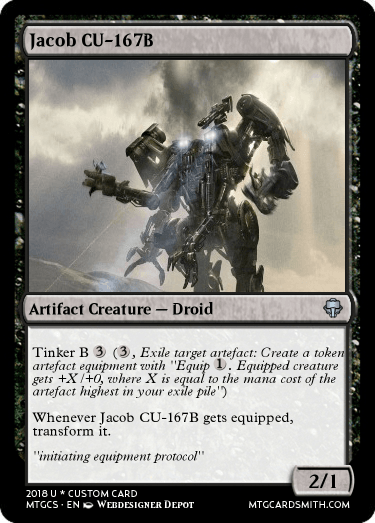 Idk, it seems cool, and I never did put a restriction on double sided cards, so I guess, since it’s not legendary and it’s a humanoid (but also a robot), it’s legal. Yes, sorry! I’ve been very busy with school and all, but yes... Sunday it will start. 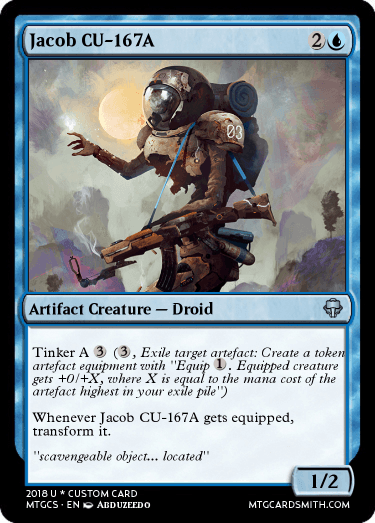 @HeroKP so wait, when you're activating the abilities of Jacob, you can exile ANY artifact on the battlefield to pay the cost? 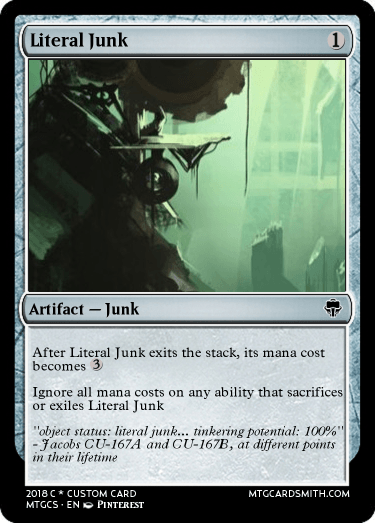 Also, the keyword is very, very weird... Why not just have the keyword be like Raid, Delirium, or Threshold? Y'know, since you're gonna be displaying the text anyway? Yes hello! I am very sorry to be the harbinger of sorrowful news, but I am much too busy to run this. If someone else would be willing to step up to the plate, you are welcome to lead.